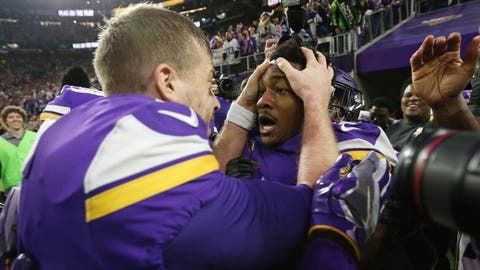 The former Minnesota Vikings quarterback gave a group of Denver Broncos fans an in-depth breakdown of his spectacular touchdown pass to Stefon Diggs, which lifted the Vikings to an improbable playoff win over the New Orleans Saints earlier this year. “This is way more than y’all need to know,” he said. Among the highlights: The play is known internally as “Gun Buffalo Right Key Left Seven Heaven,” with the “seven” referring to the corner route run by receiver Adam Thielen, Keenum’s original target. Keenum breaks down the play from his perspective, detailing everything from his confusion once Diggs caught the ball, to the noise at U.S. Bank Stadium.